Altum Health sets the benchmark for highest quality standards in rehabilitation services. We evaluate our services and outcomes against industry results and set high standards to ensure that we deliver the best care in the industry. While our results and outcomes are industry best, we are constantly focused on continuous improvement and developing new standards. 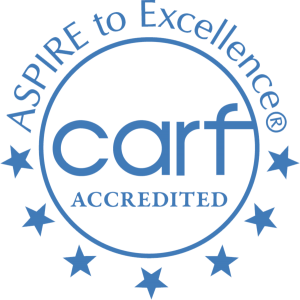 Altum Health treatment programs* have met the rigorous quality standards of the Commission on Accreditation of Rehabilitation Facilities (CARF). With a mission of ‘The Right Care, Always’ Altum Health’s clinicians are precisely focused on delivering quality care, every day, with every patient. We solicit transparent feedback and input for suggestions on improvement from our stakeholders to ensure we are continually focused on providing an exemplary patient experience for every patient in our care. Our leadership team equally empowers our people to be innovative in creative problem solving and bringing new ideas forward to both best serve our clients and produce optimized outcomes across all programs and locations in our network. Quality and Continuous Improvement is part of our DNA. This has enabled us to be industry leaders in delivering outcomes related to effectiveness, access and patient satisfaction . We collect outcomes through the use of standardized patient rated outcome measurement tools as well as client satisfaction from all our patients. This information is collected electronically and analyzed by our dedicated Integrated Performance Measurement Team. Quality of care is best understood by measuring not only clinical and processing outcomes but also understanding the experiences of clients through our patient satisfaction surveys and comments. Results are reviewed monthly against benchmarks and targets and we work together as a team to constantly find areas for improvement. This precision focus on outcomes has enabled the Altum team to improve clinical decision making, evolve and further develop our programs and services, and be industry leaders in demonstrating value for the service.